It’s a familiar story: a church closes… so what do you do with the pews? We're recycling them for the good of the community, be it Foodbank food racks, or beds for rough sleepers. And it’s thanks to amateur wood worker Ron Hilditch that we got involved. Ron was asked to make beds for rough sleepers for Wirral Ark, and he threw himself into the project, making 25 beds out of pews from Upton URC, Wirral, which closed three years ago. Then a Christian charity in Birkenhead asked if Ron could make racks for their Foodbank provisions. 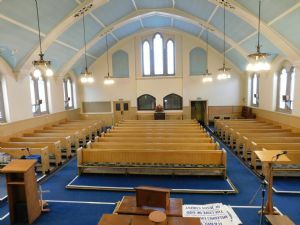 So Hamilton Memorial Church, in Claughton, has now seen the life of their pews live on, after their church closed. Ron explained, “The Claughton pews and as much of the organ that could be easily reused were dismantled and the reclaimed wood stored. I was able to construct 40 frames, and there’s now storage for 271 green baskets. Each basket contains many tins! 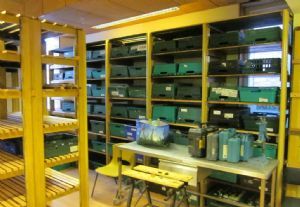 “There was enough wood to make all the required storage, and also provide timber for Men in Sheds, an Age Concern initiative in Chester, and sell several pew seats. The sale of pew seats, pew number plates and umbrella hoops substantially offset the cost of construction.